At some point the Buffalo Sabres will reach a point in which they’re confident and competent when playing in their own end. Unfortunately it looks like that day may be a ways down the road. Two more ugly defensive games magnified a pair of decent, but not spectacular, efforts from Ryan Miller as the Sabres dropped two more games to Montreal and Florida this past weekend. While the effort in Montreal was simply dreadful, Sunday’s loss to the Panthers was perplexing as the Sabres carried the play and a 3-1 lead prior to the end of the second period. Of course when it rains, it pours and it certainly poured on the Sabres on Sunday. This year’s hallmark has been poor defensive zone coverage and effort and it was evident as the Panthers clawed back to tie the game at three just seconds before the second period ended on Sunday. Brian Campbell’s winning goal was all but inevitable as most of the third period was played in the Buffalo end. In similar fashion to the way the team opened the game on Saturday – one shot in the opening 20 minutes – the Sabres closed Sunday’s game with a relatively listless effort. While they didn’t register a shot until the midway point of the third, they also allowed 13 shots in what was a tie game. In the meantime, the Vanek-Hodgson-Pominville line continues to be the only trio worth their salary as they attempt to carry the Sabres through the dismal stretch of hockey. Vanek’s torrid start was paced by a two-goal, two-assist weekend while Hodgson (1+1) and Pominville (1A) got in on the act Sunday. This 1-5-1 stretch has been magnified by poor efforts in closing games (Toronto and Florida) and generally bad defensive coverage from everyone on the roster not wearing goaltending equipment. The lone win in this stretch was one in which four goals were still conceded despite a fine game from Ryan Miller. The two most recent games weren’t as dazzling of performances by Miller but were defined more by poor efforts from various forwards and defensemen and less by poor goaltending. For example, the two-goal flurry the Canadiens enjoyed in the second period came off a well-placed three-on-two shot (born off a poor Tyler Myers pinch) and an impressive finish from Lars Eller after Alex Glachenyuk walked through a trio of would-be defenders. Both were shots that you would like to see stopped, but are also situations that you don’t need to put your goaltender in front of each and every period. The crowd who likely hates Miller’s recent play is probably growing and there is some justification as to why he could have pulled a few goals from the scoreboard. However, making a save on Parros or Eller would have done little for a team that has hung their goaltender out for 54 shots against in the last five periods he has played. What frightens me at this point is that the Sabres will need a Hasekian effort from Miller each and every night if they even hope to contend. That is, if this style of firewagon, no defense hockey continues. Miller is certainly good enough to steal games. He stole the third period against the Bruins, he shut down the Leafs at ACC, contrary to popular opinion Ryan Miller does win games on his own. However, no goaltender is good enough to steal two points each night. What is unfortunate is that the defensive shortcomings on the Sabres roster are beginning to require just that. It is true, Tyler Myers has become a train wreck. He is also entering a zone in which nothing he can do will be enough. There have been times when he has made good decisions and the puck still ends up in the net, but so many fans just see him on the ice. This is similar to what Tim Connolly and Max Afinogenov suffered from late in their careers with the Sabres. Goalies not named Dominik Hasek also suffer from this stigma. For some ultra-intelligent hockey fans, you’re never good enough. Of course, Myers has been bad and when the player who is expected to anchor the blueline is only serving as an anchor, things are going to get bad in a hurry. I’ve liked the fact that Drew Stafford has come out playing physically and has shown a penchant for two-way hockey. However, he’s been a ghost in the offensive zone and that needs to change. He’s just as much of a streak scorer as Thomas Vanek and one or two tallies could get him cooking in a hurry. Mikhail Grgorenko reminds me of Thomas Vanek in a number of ways. He is smooth with and without the puck but isn’t necessarily an electric, up-and-down player. At least not yet. He’s been a little invisible at times these last few games, but I think that could be a product of his line mates more than anything else. I’d like to see him get more time with more skill around him. The “tougher to play against” narrative was going to get old fast and although it is great that John Scott is fighting, there isn’t much need to have him dress in each and every game. Let’s face facts, even a goaltending combination of Hasek and Roy wouldn’t put up very strong numbers the way the Sabres are playing in front of their goalies. One thing to keep in mind for the “Trade Miller” “Miller is overrated crowd” just think of what this team would do with a lesser goaltender in the pipes. Special teams hasn’t been kind to the Sabres as of late, particularly the penalty kill. It seems as if they’re ill-suited at forward to effectively kill penalties and the poor high-zone rotation of the forwards is leading to more chances for the opposing power play. I’m not sure if this is a skill or coaching issue, however. On the faceoff narrative: Yes, faceoffs do matter. They’re important and it is important to have a guy who you can count on to win draws. Winning every single one is not a big deal, however. 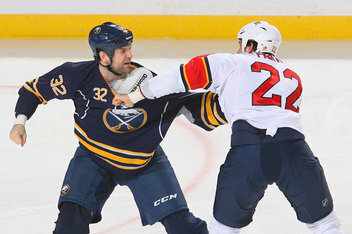 Losing faceoffs at key times and in key situation is what is hurting the Sabres.